21/04/2012: I woke up at a monkish hour to catch a coach to London. By 8.30am I was dazedly wandering the streets of Victoria looking for a place to acquire a score of pound coins for a float and a high-caffeine energy drink to shake off the lethargy following a sleepless 200-mile motorway journey. Then, off to Liverpool Street, towards to the location of the weekend's great cartooning event - the Comica Comiket. 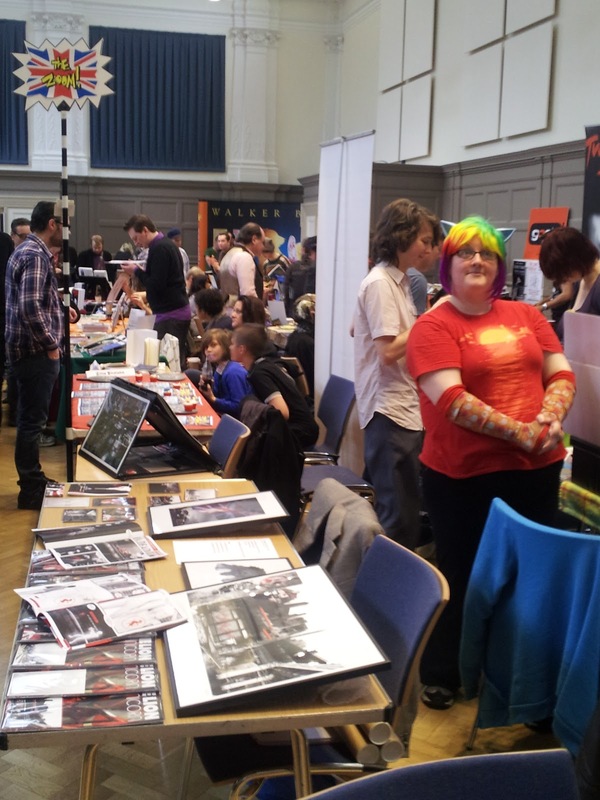 The Great Hall of the Bishopsgate Institute is a lovely location for a comix fair - a pleasing balance of ornament and simplicity, big enough for festivity without the characterless enormity of a commercial convention centre. From the stage, Paul Gravett, the co-organiser of the event and its tireless MC, announced that it would be an event exclusively for independent material, intentionally free of superheroes and cosplay (although theoretically allowable if you really wanted them), stripped of all the extraneous bits of popular culture that are frequently bundled in with 'sequential art', focussing on the best aspect of comics: "comics." It was my first solo convention adventure, and I was lucky to be situated amongst a bunch of lovely creators/publishers - shout-outs to those sharing my modicum of aisle-space, Clíodhna 'Ztoical' Lyons, Robin 'Mogzilla' Price, and Ash Pure, and the two ladies across the thoroughfare, Jenika Ioffreda and Sarah Herman. I couldn't have asked for nicer neighbours. Thanks, too, to all the visitors & fellow exhibitors, fresh and familiar, who came over to chat and buy books. Of the latter concern, I was pretty happy to make enough profit to cover the cost of the table and travel - although probably not quite the food & drink, too. The money doesn't matter but getting the comic into more readers' hands is - well - 'what it's all about'. Without a co-exhibitor to share the burden of commerce, I couldn't bring myself to have a proper look-round the hall, and bought only one comic, by Clíodhna. Dan Berry suggested allowing for an 'exhibitor's hour' (my parlance) during which the creators could browse the other tables before the visitors' opening time; I'm not sure how viable this would be, but it would certainly give sellers a chance to experience all the new material, and meet/catch up with peers without the guilt of missed trade. A few people asked me when to expect the next issue of Killjoy. Darryl Cunningham asked, and I said I'd have it done in a few months. Paul Rainey asked, and I said perhaps summer and almost certainly before Caption. A couple of other people asked later in the day, by which point August, initially a vague estimate, had become an official release date.